Click the pic to see the Norman, Arkansas in all its homespun glory. Call it fate, blind hog finds acorn, and/or Divine guidance but sometimes you just get lucky and frankly, I’d rather be lucky than good any day of the week. I had returned to the foothills of the Ouachita Mountains in the neighborhood of Glenwood AR Friday afternoon to be in nearby Norman in morning hours to photograph the front of the Norman library. I got the afternoon light the previous Saturday. See what I got last week at Weekly Grist, July 19, 2015. And see what I got this week on the Photo of the Week Page at Corndancer dot-com. I had decided to take a gander at the Norman library, my main target for the next morning, in early evening light. I struck out from Glenwood late Friday afternoon on the short trek to Norman. On the way, the little voice said “turn right dummy,” after he picked up the visual signal my big browns had sent to the receptor system upon personal observation of a street sign that said “Buttermilk Springs Road” — which headed east from Arkansas Highway 8, the route from Glenwood to Norman. The first few miles were nice, but nothing to write home about, and then all of a sudden on my right was a craggy-face near-vertical cliff grounding out less than 15 yards or so from the road bed. I could barely make out the top of the cliff being physically impeded by a fence and visually impeded by a growth of trees. Despite these interferences, the cliff appeared to be about six stories tall give or take a few randomly scattered standard deviations. 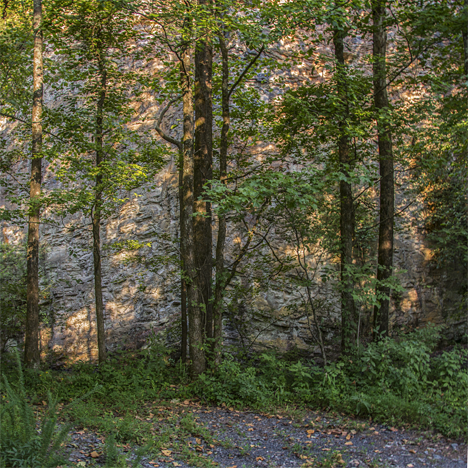 Before I arrived at the spring, I happened across this, I’m guessing 60-foot-high-plus cliff grounding not far from the road bed. You look to the right and all of a sudden, there’s a cliff. Not far from from the cliff, I found the spring. Some good soul had run a pipe into the spring output to direct the steady stream of cool, clean H2O to be conveniently caught by thirsty visitors. And yes, it had a good taste. 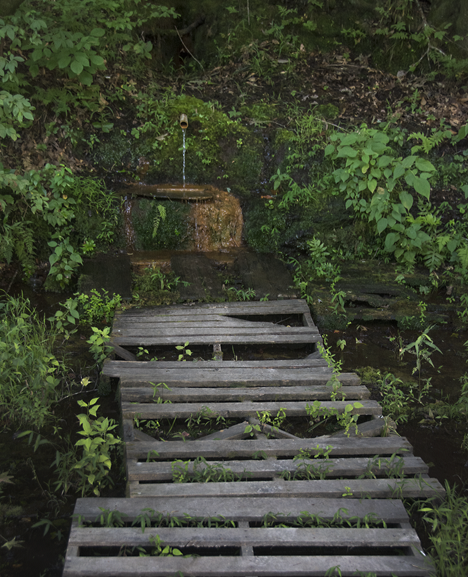 Forklift pallets create a makeshift walkway from the roadside to the outflow of the spring. I walked with extreme caution. The cool clear water was a sweltering afternoon natural treat. I happened across a local resident a mile or so past the spring. He takes care of the premises by weeding and picking trash droppings left by unappreciative visitors. 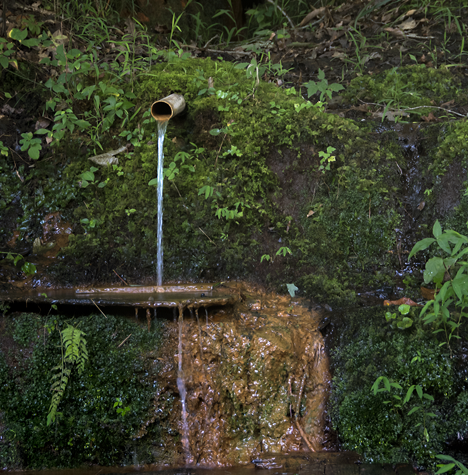 To the best of his knowledge, local legend has it that the spring has been flowing steadily for more than 200 years. He said the water had been analyzed and was brimming with beneficial minerals. He also told a story of a man whose diabetes was allegedly cured by quaffing the spring outflow for several weeks. 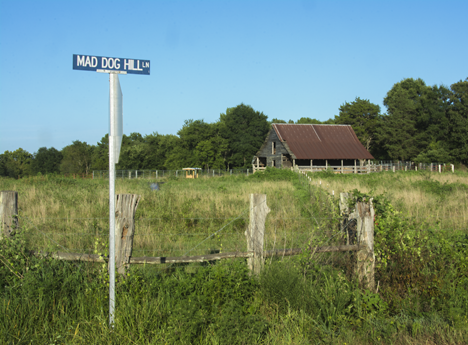 I eventually made my way back to Highway 8 via Liberty Road where I found this neat old barn broadside to the road. This is a holdover from last week. At the time I did not know what the crop was. A number of friends on facebook informed me that I was looking at an Elderberry field, my first such exposure. 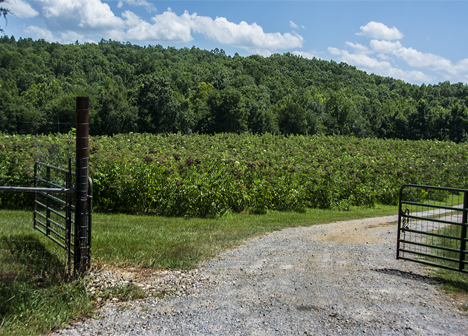 Since it may be your first look at a field of Elderberry, I included it this week. No extra charge. There you have it. Blind hog roots out an acorn or two one more time. Ain’t life grand! 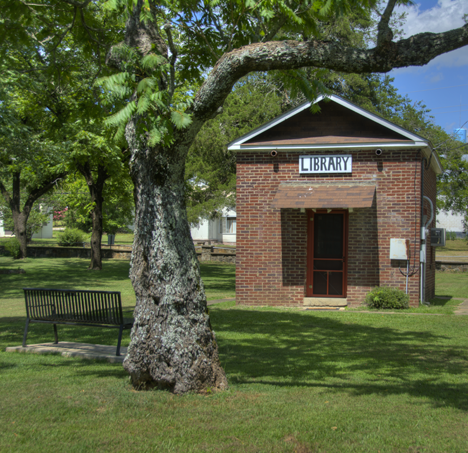 The small library at Norman, Arkansas is a favorite target of Arkansas photographers. This is the nicely lit back which means that the favored front view was pitifully in the shadows. So here you were able to see the other side. This may come as a surprise to many non-Arkansans, but our state has two, count-em, two mountain ranges. Almost everyone has heard of the Ozarks, few have heard of the Ouachita Mountains and national forest. The latter is southwest of the former and is and are the settings for our exploration today. I set out from the intergalactic headquarters of the Dempsey operations in Pine Bluff to an area west of Hot Springs, Arkansas with the small town of Amity as my jumping off place. Click on the barn for more pictures and the starting point for this story. I proceeded from there to Norman to photograph their miniscule library, a favorite target of Arkansas photographers. From there, I made the short trip to to Black Springs and from thence into the boondocks, eventually emerging at Big Fork. Between Black Springs and Big Fork I found an isolated country church and cemetery and a small bridge which were great picture fodder. 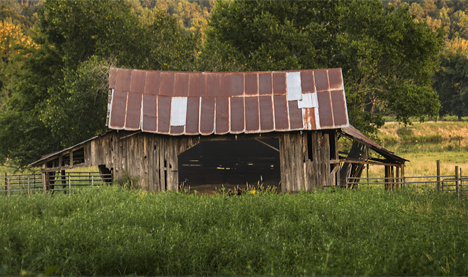 Let’s pause here and send you to the Photo of the Week page at Corndancer dot-com to see a nice red barn, the aforementioned country church cemetery, cool cattle, and more. We’ll wait here for your return. Just before breaking out of the woods at Big Fork, I came across this small single truss bridge. I had never seen anything quite like it. 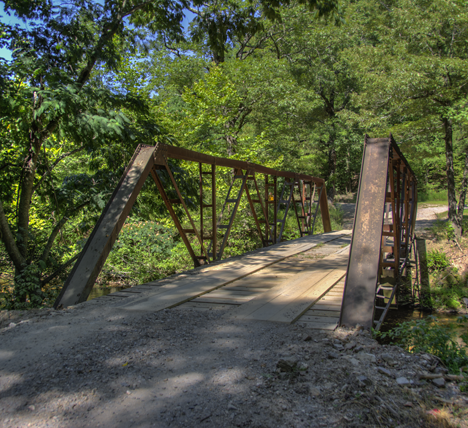 It’s not often that you find a bridge, the trusses of which, are not much taller than you. 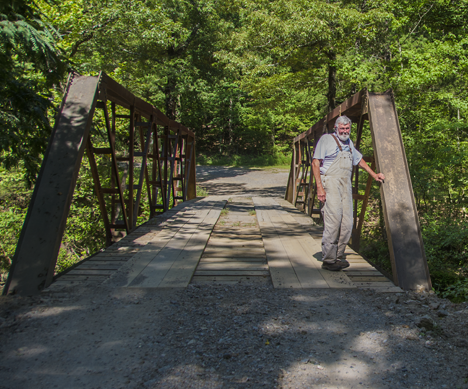 I am at my truncated height of 6′-3″ so the trusses of the bridge are around eight feet tall. You don’t see that a whole heckuvalot. From Big Fork, I made my way through Mena, Arkansas, and drove north on US Highway 71 to Arkansas Highway 28 and turned east. Highway 28 is rife with neat barns and nice old stores at Bluffton and Gravelly, I also found some cattle coolin’ it the best way they could. I had expected to see an old abandoned house behind this sign. It’s what I didn’t find that was not in the cards. Normally on trips like this, you never know what you will find, but having traveled Highway 28 before, I had some expectations. They were not to be. Here’s what I expected to see. The old house, probably a little worse off than this last picture I shot in 2011. 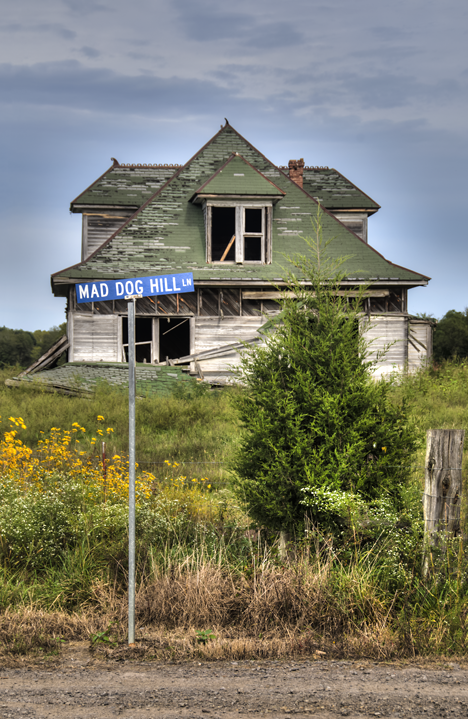 I was tooling east on 28, listening to some good ol’ foot-stompin’ southern Gospel music and looking forward to another photo encounter with the old house at the junction of 28 and Mad Dog Hill Lane. Adorned with some fine Victorian roof décor, I’m certain at one time it was the pride and joy of its owners. When I arrived at the junction I blinked twice. The site was level. No old house. The lot is completely overgrown with knee-high grass. Here it is without bushes or signs obliterating the view. That is, there it was. I photographed it first in 2009 and again in 2011. I was not the only one. 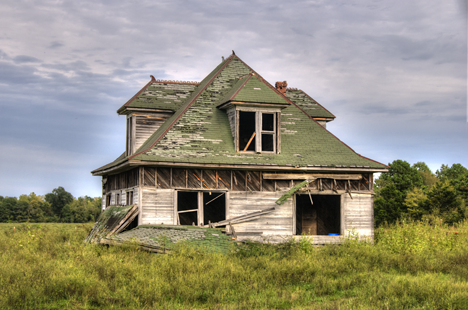 The old house was a favored target for many photographers. Goodbye old house. Even in your most decrepit condition, you provided pleasure to thousands. 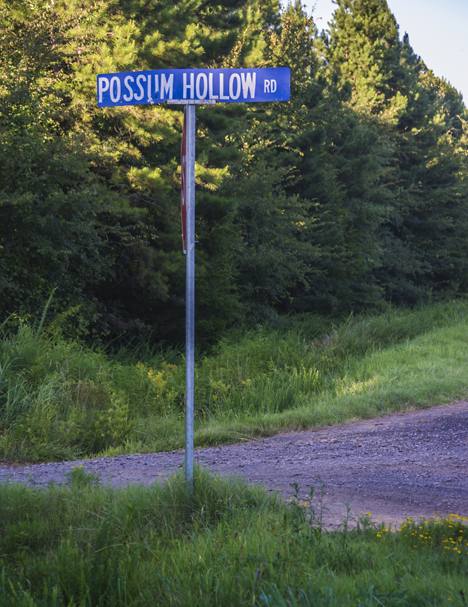 Having completed our requiem for the old house, here are a few more of the observations we made on our swing through the Ouachita hinterlands. This is an old dug well, capped off to prevent, children, pets, idiots, and drunks from plunging to the bottom. 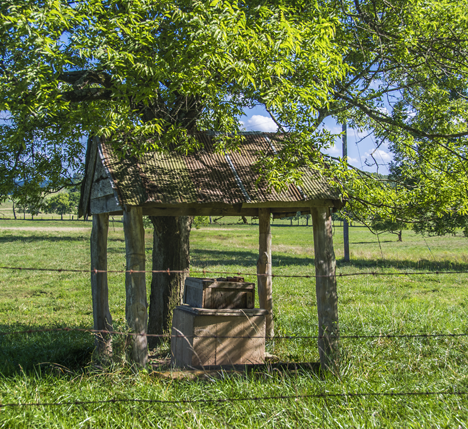 The shelter is a hold-over from the days of its usefulness. Nola, Arkansas reminds me of a childhood friend Nola Caudle Slack who is now a Facebook friend. 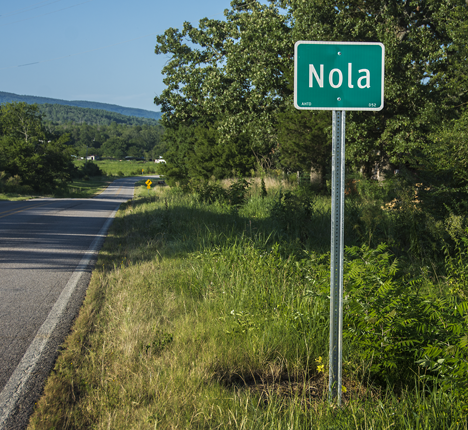 This Nola is on HIghway 28 in Arkansas. The other resides in Texas with her family. This trip was a reflection of our lives more or less. We expect the unexpected and get our way. We expect the expected and strike out. Go figure. 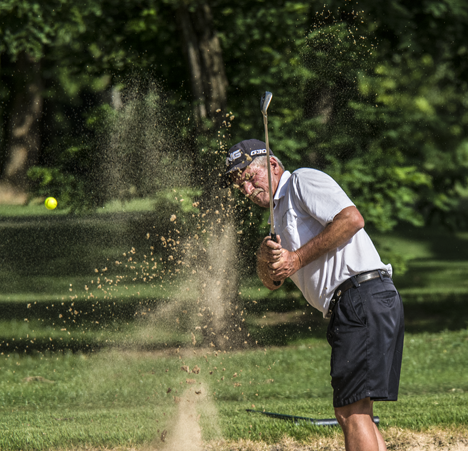 The trick in shooting sand blast shots is to depress the shutter the instant the player begins his downswing. 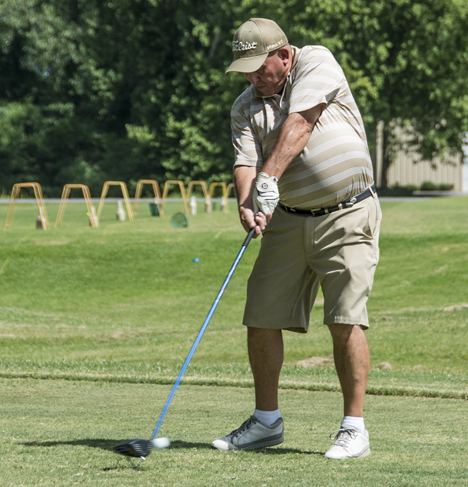 Actually a micro-second before would be cool , but most golfers do not want to hear a shutter snap before the downswing starts and most courses will not tolerate pre downswing shots. 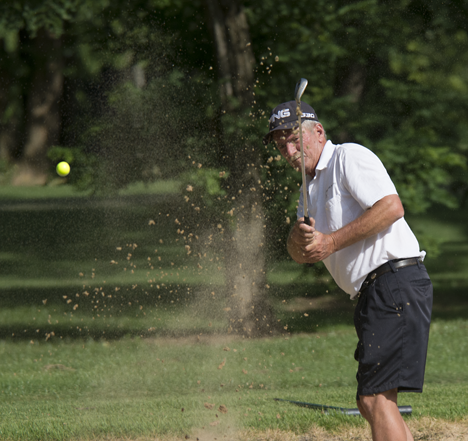 In this case, following the rules, I managed to grab a couple of Jimmy Hendrick’s shots with ball and sand splatter. Fun stuff. In sports photography many, many are shot – but few are selected. I shoot, editors edit. No argument there. A lot of the time, the rejects aren’t really rejects, but cool shots which were not selected. 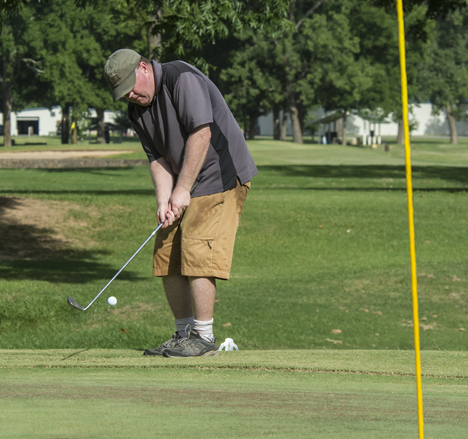 Today you will see the unselected from a recent tournament assignment at Harbor Oaks Golf Club in Pine Bluff, Arkansas. One frame past the first sand blast shot.. I have this thing about catching the ball in the air, so you are about to see several. You can see even more from this shoot on the Photo of the Week page at Corndancer dot-com. Click go, and we’ll wait here for your return. Speaking of catching the ball in the air, in most sports shots, the general rule for me is to push the shutter button just a bit before the action starts. 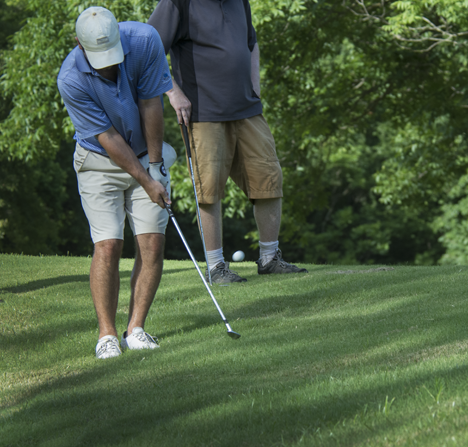 In noisy team sports that is not an issue, but in golf, the sound of shutter click is not welcome preceding the start of the player’s downswing. It will get you some nasty stares and in some venues, a forceful admonition to vacate the premises. 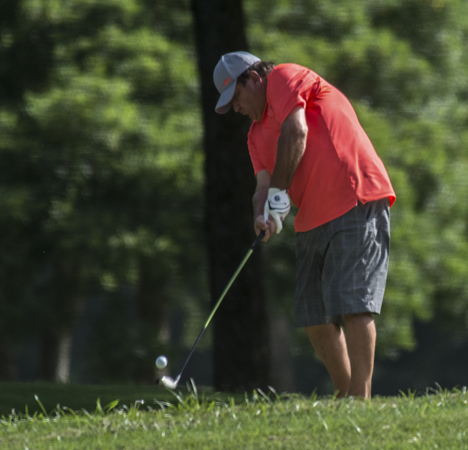 It’s always fun to capture the ball just inches from the club. Here’s another close-to-the-club chip shot capture. 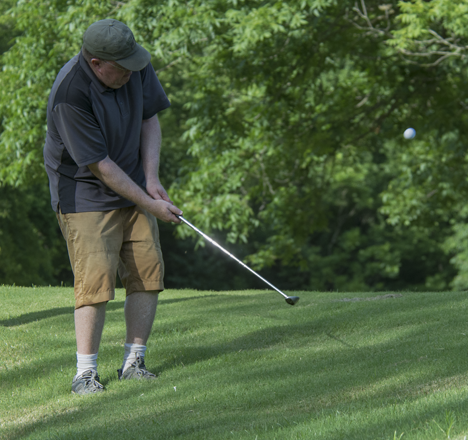 Same dude with a down-side-of-the-berm approach shot to a the green just a few feet away. This shot gives the impression that our favorite dude has just laid an egg. 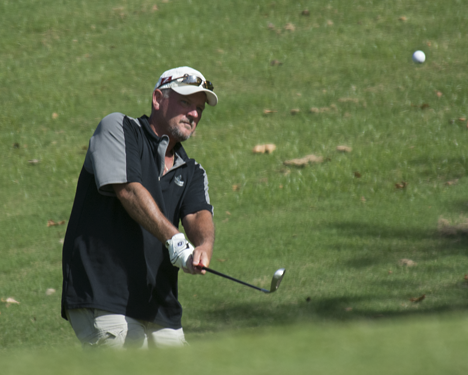 Here’s my friend Greg Walker, with his driver, his tee, and his ball – a microsecond after they became one. Well, there you have it. 15 minutes of fame for the previously unpublished. There is no moral of the story or deeper meaning. Unless you can conjure one up. See you next week. 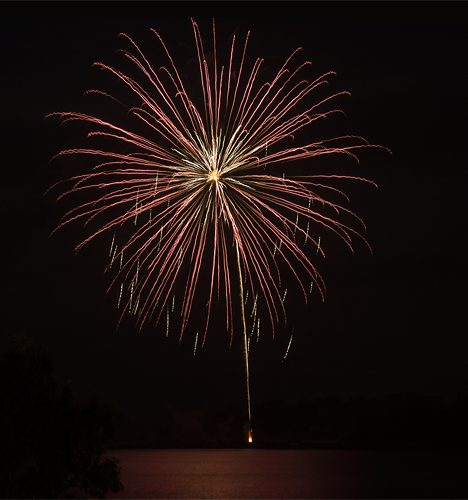 Due to lingering flood damage in the traditional area where the Pine Bluff, Arkansas, Independence Day fireworks are normally deployed, the display was launched from a baseball complex next to Saracen Lake in Pine Bluff, Arkansas. Though these fireworks were billed as the the main event, the spectacular sunset immediately prior was more than a mere warmup act. 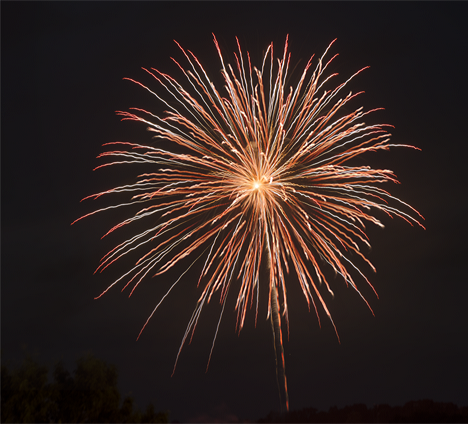 Fireworks came from two sources in the 2015 annual Independence Day celebration in Pine Bluff, Arkansas. The area in our large regional park where earthly combustible fireworks are traditionally launched suffered recent flood damage which precluded a repeat performance on that site for the 2015 extravaganza. Since the show must go on, local officials running the event moved the display launch site to a baseball complex next to Saracen Lake. 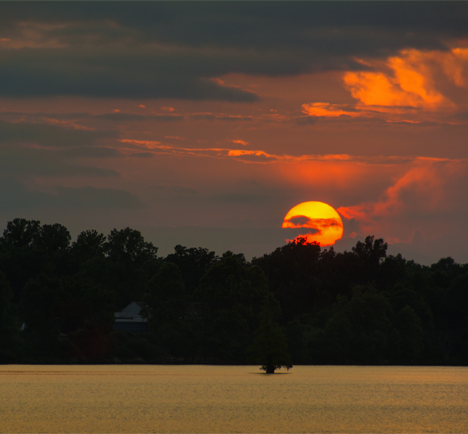 A half-hour before the earthly fireworks were touched off, the Almighty put on a celestial show of His own over the lake in the form of an eye sunset. Since the sun is a fireball, it is safe to say that the sunset was the fireworks before the fireworks. The pictures here are not the only ones we put on-line from these events. We suggest that you pause here and visit the Photo of the Week page at Corndancer dot-com and see more sunset and fireworks pictures from these two events. We’ll wait here while you look. About thirty minutes before the earthly fireworks started, the sun began dropping below the clouds in a spectacular swan song for the day. 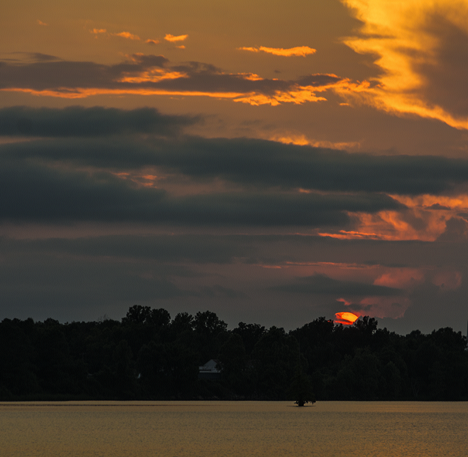 Seconds later the sun bade a fond farewell to Pine Bluff, Arkansas on July 4, 2015. 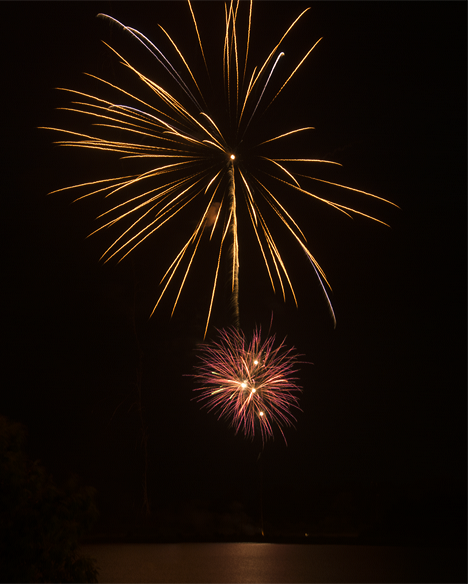 Following the solar warmup act, earthly fireworks lit the sky and reflected on the lake. You get the double-whammy on this picture as a few dregs from a previous explosion are still visible. Big and skinny is closely followed by short and compact. Both reflect nicely in the lake. When I arrived at the lake early, knowing what was about to happen before the earthly fireworks, only a few people and cars were present. By the time I left, in anticipation of the fireworks display, the crowd was growing. Few of those bothered to observe what was going on in the western sky. They finally came in droves for the sparks in the sky but were too late for solar extravaganza. They’ll have to wait 12 months for the next display. There’s a good chance the sun will do a repeat performance tomorrow.